A robotic hand developed by a team of NIU engineering students has the potential to change the lives of amputees – at about one percent of the cost of similar prosthetics currently on the market. The team of three students set out in summer 2016 to develop a functional, low-cost prosthetic hand that could benefit the uninsured or people living in poverty. While there are open-source designs for hooks and body-powered hands, the students wanted to create a more sophisticated design powered by electromyography, or EMG, which uses electrical signals created by the muscles in the arm. The hand the students developed is a fraction of the weight of similar hands on the market. It can perform a gripping motion by pinching the index and middle finger against the thumb. The grip force is enough to pick up and hold light objects, like a cup or a hand tool. Team member Nathan Freitag of Batavia, IL, said the project gave the team members a taste of the trial and error process inherent in engineering design. While the prosthetic is still in development, the team estimates it could be produced at a cost of around $300 to $500 – a far cry from the $20,000 they said they found existing EMG hands selling for. 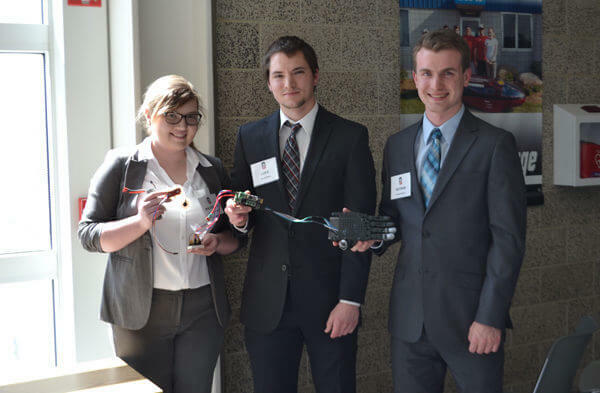 The team presented a prototype of the prosthesis for its senior design project, a capstone project all undergraduates in the NIU College of Engineering and Engineering Technology complete as a graduation requirement. The hand, which the team dubbed A.D.A.P.T., won first place in the electrical engineering division of the senior design contest, though it lost the overall prize to a Mars rover from the mechanical engineering division. Though all three teammates graduated from NIU in spring 2017, they said they plan to continue working together to refine the A.D.A.P.T., which has become a labor of love. For Franklin, the most satisfying moment of the project’s development was when their test subject, a man who had lost his hand, tried it for the first time. The team is using feedback from patient trials to further improve the next prototype.